I have just made some changes to my setup pages on JTPRC.com 1/10 and 1/8 cars have their own pages with setups. 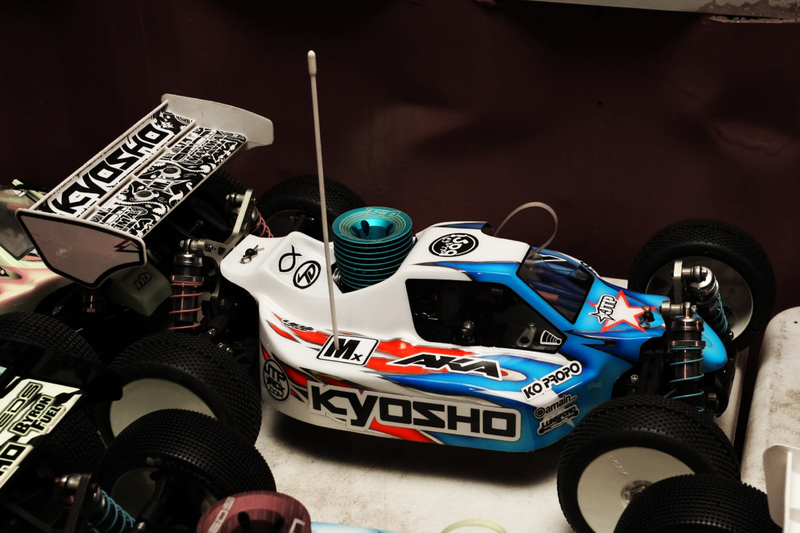 I also just added 1/8 setups to JTPRC.com Check them both out and get your KYOSHO cars all dialed in. Thanks, and God Bless! Hey Jared I was working on a new front end setup the other day and stumbled on something. When you run the new steering brace UMW724 it eliminates the 1.5mm shim on the bottom of the steering arms. What this does is lower the steering rack, and essentially raising the outside by 1.5mm. That being said if you run the Kyosho rack you will need to flip the rack bushing LA256 under the rack instead of in between and possibly the low mount stud on the outside if you are going to run spindles up and 25+0 caster. If you don’t you will have some bump out when you run 25 caster or 27 caster. 29 caster requires no shims, which is about right because before I took that 1.5mm shim out of the steering arm area I had to add 2mm to the steering ballstud to get rid of the bump in. Hopefully this helps you guys out, I’m not sure if removing the shim and affecting the bump was something they planned, but there’s a way around it to make sure you run 0 bump. Do you know where we can get the MX engines in the USA? The MX engines are not yet available in the US. Hopefully soon the MX Fuel and MX engines will be in the US. With your setups can you provide photos as well. Mostly of custom modifications, like in all of your more recent setups for the RB6 you say that you are running the battery sideways. My setups normally don’t have any custom parts. With the new sideways battery in my RT6, SC6, and RB6 those are the only custom things. I will work on posting a how to video to show that. Any chance of Kyosho coming out with some new side guards designed for this application? It seems like a more and more popular things to do. Think there is a chance that Kyosho will release new side guards to complement this trend? Hey Jared what outdrives do you run on the strr evo? lightened of some kind .